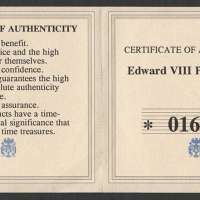 Serial Number: 01662 out of 9,999 issued. 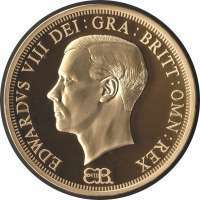 The gold sovereign was never issued for Edward VIII as he abdicated before his coins could be produced. Undoubtedly the reverse design would have been the same as previous issues i.e. St George & the dragon. 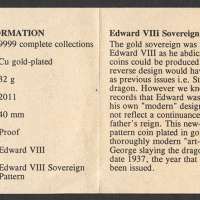 However we know from historical records that Edward was keen on having his own "modern" design coins that did not reflect a continuance of his father's reign. 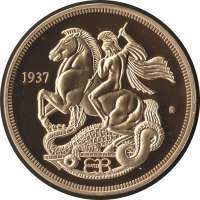 This new-strike proof pattern coin plated in gold, depicts a thoroughly modern "art-deco“ inspired St George slaying the dragon. 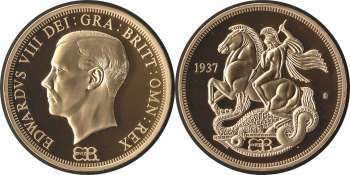 It bears the date 1937, the year that it would have been issued.